The William G. Pomeroy Foundation has announced the launch of its national Historic Transportation Canals Marker Grant Program, designed to promote cultural tourism and commemorate transportation canal history. arkers in this program will be installed near existing or former canal sites. The colors of the canal markers are blue with black lettering and border. There are two unique logos that applicants can choose from. Markers are 18” x 32” cast aluminum with a 7’ aluminum pole. The Pomeroy Foundation is a private, grant-making foundation based in Syracuse. One of its main initiatives is helping people celebrate their community’s history through a variety of historic signage grant programs, including its new historic canals marker program. For more information on the William G. Pomeroy Foundation, visit their website. 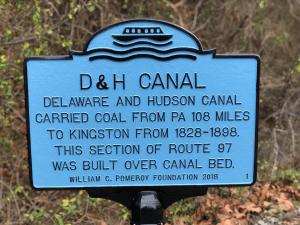 Photo of D&H canal marker provided. Nice to see this happening. For a few years, the Canal Society members would pay for markers at significant locations and would unveil them during study tours.